Ms. Helen Bartholomew, Founder of International Education Specialists, and Mr. Rex Castañeda, President of Antoine De Saint Exupery Travel & Visa Company, shake hands after signing a MOA which increases opportunities for students in Isabela and Cagayan and to take paid internships in the USA and Australia. 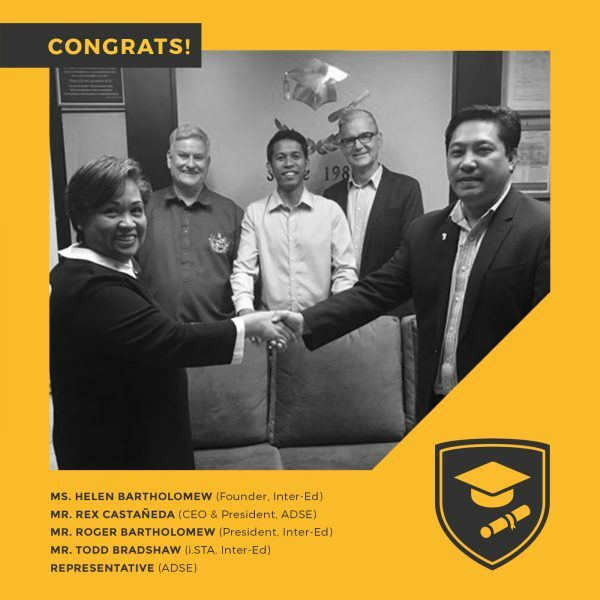 Inter-Ed, based in Salcedo Village, Makati, has been the pioneer since 1980 of counseling and placing students for overseas study and helping their career development with paid internships in Australia and the USA. Students from all disciplines can be placed for paid internships in Boston, New York and San Francisco. Students from Hospitality and Culinary disciplines can be given paid internships anywhere in 4-5 star properties in the USA and Australia, and Nurses can be placed for specialist paid internships in Australia in the areas of disability nursing and geriatric nursing. Inter-Ed can be contacted by texting 0918-904-1282 or through its website at inter-ed.com. Antoine De Saint Exupery has its main operations in Isabela and Cagayan and focuses on IELTS preparation, and migration to Canada, but will be working with Inter-Ed for students in Isabella and Cagayan to gain paid internships in Australia and the USA. Communication skills is one of the most important requirements for interns, and IELTS preparation can be key to achieving this, with the IELTS result being proof of capability. ADSE can be contacted by texting 0998-865-1386. Ms. Bartholomew said that the combined strengths of the two organizations will be of great benefit to all potential interns in Region II, and that Inter-Ed will be conducting talks and seminars with ADSE in schools, colleges and other venues in Isabela and Cagayan in the near future.